The Book Juggle originates over @Vicariously & Voraciously, which is a new find for me – but it’s super cool. The Book Juggle is all about what you’re reading at the moment, and what you think so far. It’s a great way of organising your thoughts, and I think it’s pretty interesting to get an as-you-go-along review! The Celts are one of the world’s most mysterious ancient people. In this compelling account, Alice Roberts takes us on a journey across Europe, uncovering the truth about this engimatic tribe: their origins, their treasure and their enduring legacy today. What emerges is not a wild people, but a highly sophisticated tribal culture that influenced the ancient world – and even Rome. It is the story of a culture that changed Europe forever. I went to visit Wroxeter with my grandparents a couple of weeks ago. We’ve been compiling our family tree, and it turns out we had an ancestor who lived there. Wroxeter’s a great day out, we had a blast, and I found the whole thing very interesting. It’s an English Heritage site, who are a fantastic organisation, and there’s a little museum, a shop (where I spent wayyyy too much money! ), and the excavations are incredible. I highly recommend it, if you’re interested in that sort of thing, and get a chance to go. Anyway, I’m trying to write a fiction book based around the lives of those ancestors I mentioned, so I picked this up at Wroxeter for research purposes. 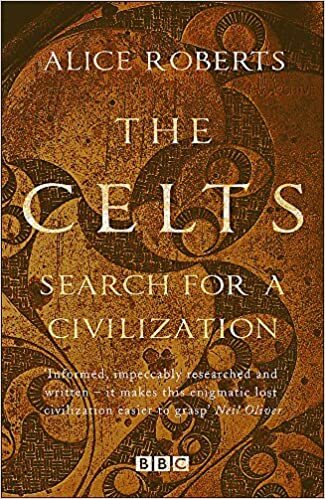 I’m enjoying it so far, though it’s focused more on the Celts on European mainland than in Britain, which is a bit of a bummer for my area of research – but still relatively useful, and quite interesting. Alice Roberts is a TV presenter, and you totally get that from her style of writing. I actually like that, because I think it makes it more readable. I think there might be a BBC series for this? I might check that out next, if I can find it.